"See the world as yourself, have faith in the way things are. Love the world as yourself, then you can care for all things." Most of us sense the truth in Lao Tzu's words. you, me, them, us, bad, good, right, wrong, etc. This creates a lot of suffering for ourselves. the spacious Heart which knows itself to be nothing and everything. with fresh eyes and curiosity. Is the body that I call "mine"
really any more mine than the body that I call "yours"? any different from the essence of life in this body here? is indeed shining with the Light of Love, that which we are. and outdoors on the back porch singing to and with the trees and birds. We will go at an easy pace with lots of time for resting and reflecting. to join me in playing for our dancing. 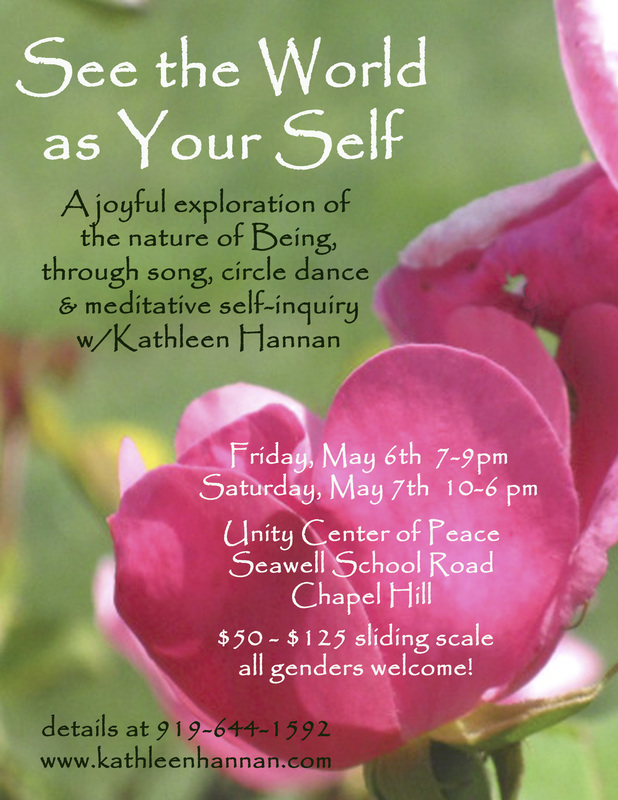 I invite you to come explore and celebrate the deepest truth of who you are.